You will receive a cute little jewelry bag for each ring you purchase. Please take off when sleeping,Store your jewelry inside this soft cloth pocket or fabric swath. Measure your finger size before purchase, for ring set and band can not be resized. The paper measurement is intended for reference only. We would like to suggest you have your finger sized at a jewelry store for an accurate ring size. This is a beautiful white 3 pieces top quality women's wedding white gold filled engagement ring bridal sets . The feature of women's engagement ring main stone is a heart cut stone in center with a prong setting. There are 2 matching rings with this wedding set. It's white and clear AAA grade cz stones with high clarity and refraction. 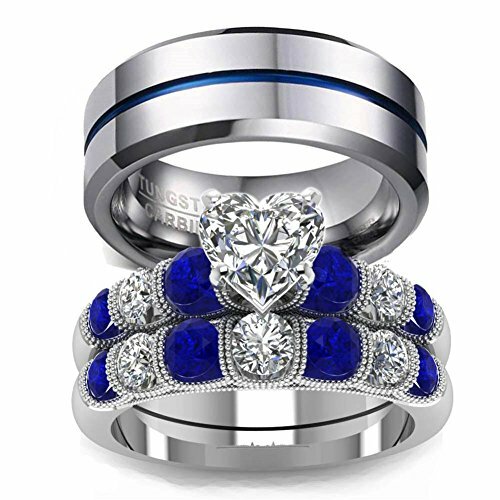 PERFECT RING GIFT: This is the perfect ring gift to symbolize your love on the special days of anniversary, families, friend's, birthday, wife, girlfriend, valentine's day, thanksgiving day and Christmas Day.The Rings will come in a free nice jewelry bag. Ready to give to your partner. You just have to find the right moment and time to present it to your future bride.